Up until recently, the American heavyweight landscape in boxing has been in shambles. For nearly the last decade, the division was dominated by the Klitschko’s and there hasn’t been an American heavyweight that has really drummed up interest up until the last few years. During the Klitschko’s reign of dominance, there was one American hopeful that appeared to be heading for stardom. 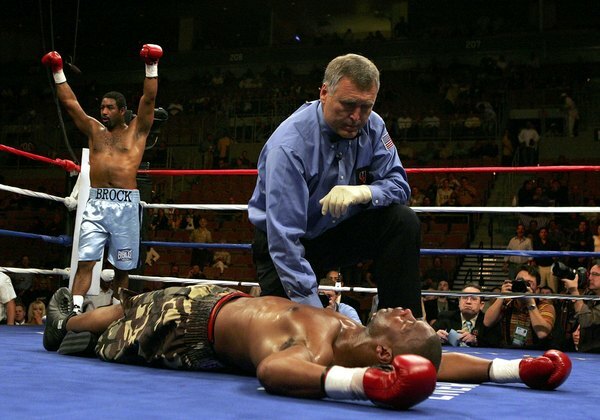 That man was former 2000 U.S. Olympian Calvin “The Boxing Banker” Brock. Brock was a fairly decent sized Heavyweight with great skills as well as packing a big punch. Brock was born and raised in Charlotte, NC and had a very successful amatuer career of 147-38 which included a spot on the 2000 U.S. Olympic team in Sydney. He turned pro in early 2001 and would win his first 23 bouts over the next four years, 17 by KO. During boxing’s brief return to network television from 2003-2004, Brock was featured on Main Event’s Saturday afternoon boxing series televised on NBC. 2005 was a big year for Brock as he would go 4-0 that year which included two wins over fairly well known veterans Clifford Ettiene and Jameel McCline. Brock would begin the year 2006 with a bang as he scored a huge sixth round KO over Zuri Lawrence on a big HBO PPV card headlined by Shane Mosley vs Fernando Vargas. The KO over Lawrence would be Ring Magazine’s Knockout of 2006. He would follow up this performance with a 12 round unanimous decision over Timur Ibragimov four months later as he made his HBO debut. That would setup a shot at Heavyweight Champion Wladimir Klitschko. They met on 11/11/06 at Madison Square Garden in New York City for the IBF and IBO Heavyweight Championship. It wasn’t Brock’s night as he was stopped by Klitschko in seven rounds. Despite the bad loss, Brock would win his next two fights over the next seven months and he was once again back in the Heavyweight Championship hunt. He would take part in an IBF Heavyweight Elimination Tournament and would face Eddie Chambers in the semi-final. They met on 11/02/07 in Tacoma, WA. It was a good, close fight in which Brock would lose a split decision, however he would suffer a career ending injury as he suffered retinal damage. After having surgery to repair the retina, Brock was declared legally blind in his right eye, forcing him to retire from the sport. His record as a professional stands at 31-2 with 23 KO’s. Today, Brock is a commercial real estate agent. He was a very talented and skilled fighter who had all the tools to become Heavyweight Champion. What would have happened had he not suffered the eye injury? Could he have rebounded to stay in the Heavyweight mix and win a world title? In the end, he was another very good fighter who had his career cut short.